In case I haven’t mentioned it already, you should know that my entire family loves the game of soccer. Five out of six of us play, coach, and/or referee – leaving me to do what is safe and wise: 1) feed them all well 2) try to keep up with the practice/coaching/game/referee schedule as much as is humanly possible 3) cheer loudly from the sidelines and 4) for the love of everyone involved, stay far away from the soccer ball. Because an entire morning of soccer games is apparently just not enough, Matt and the boys decided to start a pick-up game on a small field with a few of their young friends. My kind husband then asked if I would like to join them out on the field. I hesitated briefly, but given the fact that I am determined to get fit and thought that spending that time on the field with my family might actually be fun, I said yes. After all, I was cold. I figured that I could at least play for a couple of minutes so I could get warmed up a little bit. One hour and fifteen minutes later, we decided to be finished. Yes, for one hour and fifteen minutes, I played soccer. On-lookers may not call what I did “playing soccer”. It may have appeared to be more like a crazy 38 year old woman stumbling across a soccer field while occasionally making haphazard foot contact with a rolling ball. But I’ll have you know – I scored five, yes…count them…FIVE goals. Why yes, I did. I’m not entirely sure how it happened, because during the entire game, even though my brain often knew just what to do, that message usually didn’t quite make it to my feet. Generally, I felt like my feet were made of cast iron and wouldn’t budge or lift or turn the way I was trying to tell them to. But, since I was on my husband’s team, he obviously did a great job feeding the ball right to my foot so that I could force, flick, or otherwise, fling the ball into the net. Oh, had I told you that number already? I should also mention that by the end of our game, I was so tired I could barely walk. And yes, today, I do have some bruises and sore muscles. Playing soccer definitely uses quite a different variety of muscles than does walking, jogging, lifting, and doing work-out videos. And the bruises. I definitely learned why shin guards are required for soccer. But it doesn’t matter, because I scored five! Congratulations! Feels good, doesn’t it? 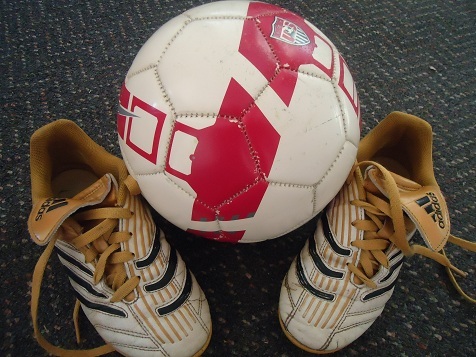 One of my worst memories of soccer is when we were playing with some friends and their little girl (age 2 or 3, maybe?) walked into the playing area. My kick was totally off and the ball hit her square in the face. I felt terrible, but she was okay. Awesome!! I love the game of soccer to. My daughter use to play and I’d go to every game and scream from the bleachers. Would have to agree, soccer is a ruff sport. Sure it’s a great work out for ya. I remember the first time I went for a run. I ran six – six whole blocks before I had to give up because my knees hurt and my lungs were raw from breathing hard. But boy did it feel good! It may sound silly but my six blocks are six more than when I just stay on the couch. And your five goals are five more than you score when you don’t join in, right? Hey, six blocks is six blocks – great job! Can’t wait to try the butterscotch bars! way to go Laura! I’m so very impressed! that’ll keep the boys talk’n for a while :) 5! I made your applesauce bread yesterday and my kids loved it. I did use a little sugar instead of rapadura…still trying to work on the healthy baking thing. But, the bread is almost gone today. Thanks for all of your recipes. Its very inspiring! Way to work that ball!